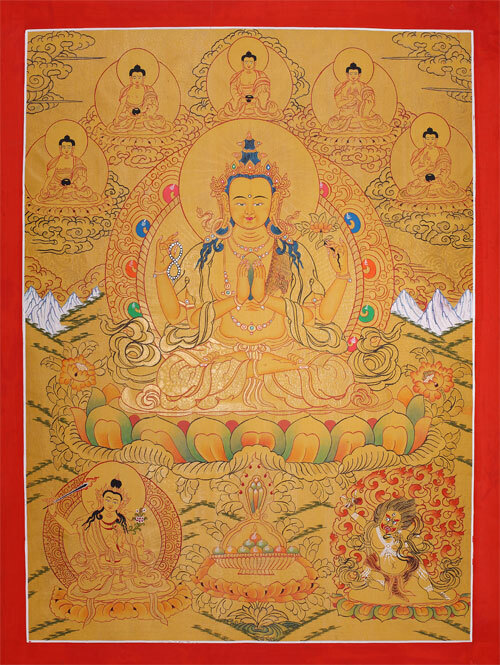 Dieser Thangka des Bodhisattva Chenrezig wurde sorgsam auf Goldgrund gemalt. Avalokiteshvara erscheint hier in seiner 4-armigen Manifestation als Sadakshari Lokeshvara. Über ihm sind die 5 Meditationsbuddhas (Dhyani-Buddhas, Tathagatas) zu erkennen. Unten zeigt sich der Weisheitsgott Manjushri und der Dharmapala Vajrapani. This Thangka of the Bodhisattva Chenrezig was carefully painted on golden background. Here Avalokiteshvara appears in his 4-arms manifestation as Sadakshari Lokeshvara. On top the five Meditation-Buddhas (Dhyani Buddhas, Tathagatas) are visible. Below appears Manjushri, God of wisdom and the Dharmapala Vajrapani.